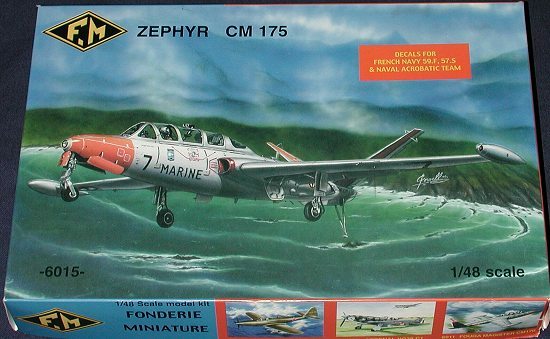 The CM-175 Zephyr is basically a navalized version of the CM.170 Magister that was such a success for Fouga. The aircraft themselves are quite similar, but there are some differences that make the Zephyr unique. The most obvious of those is that the Zephyr has a tail hook. Though it does not spent a lot of its time at sea, the aircraft is used to train carrier pilots so the ability to land and take off of an aircraft carrier is a requirement. Another difference between the two is that the CM.175 has a sliding canopy and the center and instructors transparencies are a different shape than what is found on the CM.170. Though not apparent, the Zephyr is structurally a bit stronger as well in order to handle the stresses of carrier landings. Most Zephyrs also carry outboard wing racks for bombing practice. I'm not sure if they are plumbed for fuel tanks or not, but few of the slides I have show these racks at all. The Magister is long gone from the French Air Force inventory and there are few still flying in the world's air forces. However, the Zephyr is gone having been removed from the inventory in 1994. So few are the number of carrier pilots needed that no replacement has been sought. French carrier pilots now get their basic training in France, come to the US for carrier training flying T-45s and then return to France for follow on training . This kit is quite similar to any other F.M. kit. 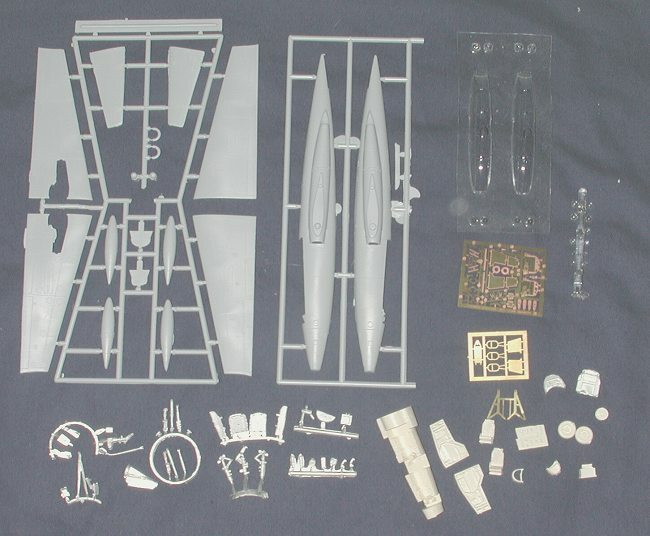 The major airframe parts are in injected plastic with the interior and wheel wells in resin, landing gear and some other bits in metal, the canopies in vacuformed plastic, and a number of other smaller items in etched brass. The quality of all these different parts varies quite a bit. The etched brass bits are very well done and as good as you'll see anywhere else. The injected plastic airframe parts are also well done with engraved panel lines that are not too light or heavy. The surface is slightly 'pebbly', but that will disappear under a coat of primer or paint. These parts do suffer from some flash, but it is minor. The resin parts are fairly well done though they are a bit on the rough side. Again, this roughness should disappear under a coat of paint. The metal castings look to be good, however, most of them have flash of varying degrees on them and so with require some time cleaning them up. The vac canopies (and there are two of them, which is quite nice) appear to be quite well done. A couple of problems are that the aft pilot's canopy frames seem to be at a greater angle than it should be. This makes the fixed section in front of it too short (length-wise), and also makes the part behind it too narrow at the top. Unfortunately, there is no fix for something like this so the builder will just have to live with it. The clear bits for the nose and tank tips were also rather badly crushed on my example. Apparently this is a real problem for F.M. has included some injected plastic parts as a replacement. 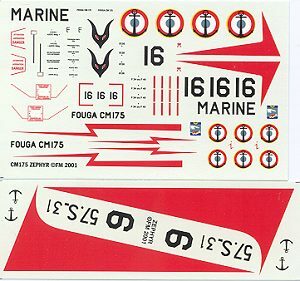 The instructions are better than some other French companies, and not only provide several exploded diagrams, but also have a number of alignment and placement diagrams to ensure proper parts placement. Looking at the instructions, it seems as if the most difficult part will be the installation of the nose gear. The metal nose gear assembly is basically held in place by two etched brass parts that attach to the front of the resin cockpit tub. That will be fun! Painting information is sparse, but sufficient to get things going. Markings are provided for four aircraft. One is from 57S in Khourigba in 1960 and has a small red, white and blue fin flash that you will have to paint on. There are two schemes for the Patrouille Acrobatique from 1962 with large red areas on the fins and upper wings, and one scheme from 59S in 1994 with Day-Glo patches on the nose and tail. These schemes are all given as being bare metal. However, as you can see from the photo at the start of the preview, at least the later scheme should be in aluminum paint. The decals are well printed and should work fairly well. I hope so as there is nothing in the way of aftermarket decals for this aircraft. Not shown is another red wing decal to take care of the glitch of having two for the left side! Easy to build this probably won't be. I'd even say that there may be a relatively high level of skill required to complete this one. For some reason, French short run kit makers have not really progressed that much over the years in terms of engineering of their kits and each one is a challenge. However, once finished, it will produce a model that will be unusual.